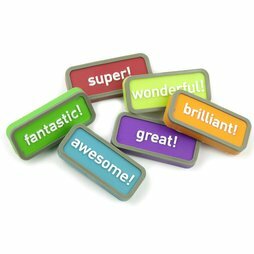 A magnet says more than a thousand words: You can compliment, inspire and motivate with these magnets. Exclamation mark included. Awesome! A cool magnet for any situation. One word says it all. A single deco magnet is 40 x 18 x 6 mm big. There is a neodymium disc magnet on the backside. The magnets will be delivered in this packaging, which can be used for a gift as well.